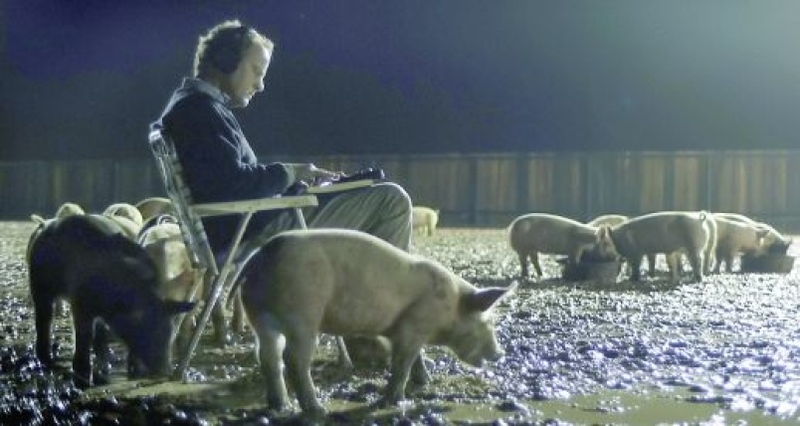 Upstream Color – Review – Screenkicker! I could attempt to explain what Upstream Color is about but I’m not entirely sure I know myself. It could be about how we treat animals, it could be a film about the human experience post the millennium, or it could just be about how pigs see the world. Again it’s probably nothing to do with these ideas. Upstream Color is written and directed by Shane Carruth (he also acts in it) the guy who produced brain pummeling time travel flick Primer. And if you had a hard time following the intricacies of that then UC will leave you totally bewildered. It starts with a man harvesting some kind of maggot from a strange plant. He then goes on to implant it in an unwitting woman who he then commands using some form of hypnotic suggestion. These commands mainly involve knitting, playing board games, and transcribing a book. Its after this that things become truly weird. It won’t be for everyone, there isn’t much dialogue, scenes are jumbled, and there are lots of quick cuts. There is always the danger that the entire film will collapse into a confusing mess and at times it does but not for long. It’s to Carruth’s credit that there’s always a beautiful shot or an intriguing piece of dialogue to keep you watching. What’s the connection to the pigs? Why do the man and woman share memories? What is the significance of the colour blue? Typical of this type of film, these questions are never really answered. But that’s OK. The answers would probably detract from the whole. It’s all about your own perception and whether you like looking at pigs for long stretches. Which by the way I do. Many will hate the film or become bored. And at times these bouts of boredom can be justified. Take for example a side story about a couple who don’t seem to get along, it doesn’t add anything to the movie but it only lasts five minutes. If it sounds like something you would like then give it a go. But don’t be expecting to have any great insight by the end of it. If you get nothing from it in the cinema you’ll still have an opinion after when discussing it with others. Upstream Color is a strange, dreamlike, confusing ninety minutes but when it all came together at the end I realised that I quite enjoyed it. Interesting. one of Fogs’ latest Reader Recommendations talked about Primer, and that really got me curious about these films. I’ve never really even heard of Carruth’s work, but I’m always down for some mind-bending awesomeness (or P.O.S.’s, whatever they end up becoming…) Nice review! You got my curiosity as well. I think the significance of the pigs is the role they play as resiliant, hearty survivor type choices for an important link in the symbiotic or parasitic (depending on your POV as either end game beneficiary or enabling supplicant) chain. An evolutionary cascade that is played out in myriad fantastical and seemingly impossible scenarios all throughout the natural world of animals and insects etc. The hard part to wrap your head around is the realization I believe the film is ultimately trying to make; That is, human beings think themselves invulnerable to such an inconcievable menace, and with good reason. Nobody would waste time worrying about being a disposable host-cog in a Darwinian acid nightmare menage a quatre scenario whereby they find themselves dominated and violated by larvae and orchids in a ruthless and metaphysically inconsequential game of…king of the hill, or something akin to the bully unknowingly having his lunch eaten by the sickly schoolyard whipping boy as the fat girl all the plastics berate relentlessly distracts him with the promise of a vast supply of unending twinkies that exist not. So, possibly a cautionary tale of how things could go awry if people continue to abuse their environment through a hyperbolic analogy dreamed up by a guy who loves Lynch and Cronenberg. Or maybe black ops out of control as the boogey man. I mean, was the pig shephard the last remaining link to governmental experimentation run amok…possibly…I think so. Why all the files and database etc. if not an intentional experiment. Sorry about the grammar and spelling…feeling lazy…where is Waldo…I mean Walden. Wow what an amazingly well thought out interpretation! It’s the thing I really loved about the film, there were so many ways you could read it. Thank you for the excellent comment! Sorry Mikey, I was just messing about. Keep on keeping on and flogging the blog. On a serious tip, pls tell me where i can find Primer. Available online I hope. Cheers. Hey thanks, Primer is on Netflix if you have access to it. I’d definitely recommend it to anyone. Enjoy!